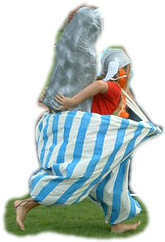 Material: Obelix costumes incl. Grind stones and a bench as a handicap. This game is only possible if the complicated utensils are prepared in advance. An oversized pair of trousers with braces is tied to a plastic ring. A grind stone made from papier machee and a wig with red plaits and helmet must be produced. On the start signal the first runner pulls on the costume (assistance required), carries the stone on their back and completes a relay course with 2 hurdles (benches) to the next runner.